These days it’s hot summertime, but you still need to cook! Even on the hottest days you can always get some energy from your own homemade food. 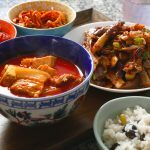 Today’s recipe is another simple and easy recipe, spicy pork stew or dwaejigogi-jjigae in Korean, a spicy, savory, juicy stew made with pork belly. Usually when I cook with pork I add kimchi, but this one doesn’t have any kimchi at all. However it’s still pretty spicy! And even though it’s made with pork belly, it’s not greasy at all. For me, the taste is very refreshing! Posted on Tuesday, July 17th, 2018 at 7:12 pm. Posted March 14th, 2019 at 11:16 am | Log in to reply. Hi Maangchi, I just love following your recipes. It’s easy to follow and the outcome is so good. Makes me want to cook everything on your website. Hahaha!!! Posted March 8th, 2019 at 2:28 pm | Log in to reply. I made this today and it turned out great. I added a little rice wine vinegar for acidity, some carrots. I left out the tofu because I didn’t have that already and I used fatty chunks of pork loin because that’s what I had on hand. Very delicious. Posted December 1st, 2018 at 1:01 pm | Log in to reply. I made the recipe yesterday but it didn’t work so well (it was Brown soup and very (too) spicy but not much flavor. I used sambal instead of pepper paste because it wasn’t available here. Same goes for pork belly and the Korean flakes. I used regular ground chili flakes and pork chops. Was that the problem? Posted November 18th, 2018 at 9:14 pm | Log in to reply. I made this stew for my wife, her mom and her sister. I knocked down the spice a tad by leaving out the green chilies and they loved it. I plan on experimenting with some more of your recipes. Posted August 7th, 2018 at 8:05 pm | Log in to reply. Your recipe inspired me want to cook it so much for my family this week, and so I did! Admittedly, I didn’t follow your recipe exactly, but the stew was still wonderful and the outcome is the same–MY FAMILY LOVED THE DISH! Thank you and my kids and I love your videos! Posted August 3rd, 2018 at 6:24 am | Log in to reply. This looks fantastic! This will be the next soup I make, for sure. Posted July 30th, 2018 at 2:30 pm | Log in to reply. Hi Maangchi! This looks amazing & I just bought a pound of pork belly at my local Korean store. It’s named Seoul Foods in Fridley, Minnesota. I bought your cookbook when you first released it & I proudly display it in my kitchen. This past Saturday I made Kmchi Pancake – so awesome! I’ve made many of your recipes! I love your videos, so are so cute! 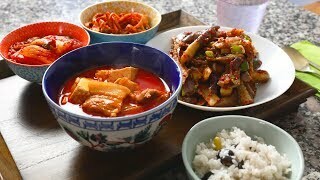 I have one question on the Spicy Pork Stew; what firmness of Tofu did you use? Posted August 13th, 2018 at 8:28 am | Log in to reply. Thank you so much! I’m so happy to hear that your Korean cooking is going well. I use medium firm tofu. I hope that your pork stew turned out good! Posted July 30th, 2018 at 9:59 am | Log in to reply. Posted July 19th, 2018 at 10:13 am | Log in to reply. I make something very similar. Daikon works well instead of potato and a little cabbage or nappa is nice too. I blanch pork belly first for 10 minutes. It removes some of the impurities and fat. Allow to cool then slice it. Sometimes sear the belly skin side down first then add cold water to the pan. 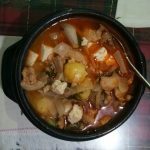 This recipe was originally posted on July 17, 2018 at 7:12 pm by Maangchi. The video was watched 566,608 times on YouTube & has 16,729 likes!